There are tons of photos lying at home - beginning 4 generations ago. Both positive and film negative. Want to digitize them. Any recommendations for good film negative/positive scanners? I could find a bunch on Amazon and Ebay, however haven't done enough background homework/research. Alternately, if anyone has this in Chennai and can spare for a few days, I'd obviously be most thankful! Internet connection at home is provided via DSL/PSTN connected to DLink 502T connected to Linksys WRT54GL v1.1. I need bandwidth monitoring software - one that gives me current upload/download information as well as historical trending information. Unfortunately neither DLink nor Linksys provide this in their official software/firmware. Linksys WRT54GL firmware from Tomato, DD-WRT and OpenWRT all of these seem to provide bandwidth monitoring. Incidentally, I chatted up Linksys support today. And while they were quite helpful and gracious, they didn't have any solution to this other than to state that this is supported only on 3rd party firmware, but running 3rd party firware will void warranty :) There was no option for them to take a feature request from customer. I'm sure this is a much required/requested feature for most customers who buy home broadband wireless routers. But without official support, it's kinda stuck. And I'm not talking about dual sim phones. Virutalization is very well know in the world of computers - laptop, desktop, etc. Infact, I had some of my first trysts with it _years ago_ when I ran Red Hat Linux on my Microsoft Windows desktop using VMware. There's still a lot of evolution happening in that part of the world. Now, here's something neat and surprising. LG & VMware are supposedly working together to create a new phone which will use virtualization to support 2 phones - for personal and office use - on a single physical phone. Will be interesting to see how this takes off! LG and VMware have created a partnership intended to deliver a dual-profile mobile smartphone sometime in 2011. As a result, users should eventually be able to carry a single device that logically segments personal applications and data from work resources so that IT departments can manage and secure just the corporate “side” of the device. VMware mobile middleware will create two virtual instances of a smartphone in one physical device. The virtualized phones will have two phone numbers – personal and work. Presumably, the employee could receive an invoice for personal usage and the company could receive an invoice for corporate charges. 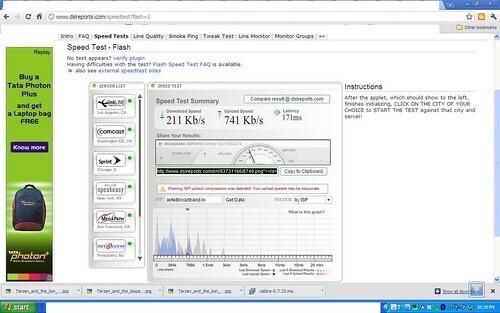 I tried out download speed tests and there's something I'm either missing or fishy. 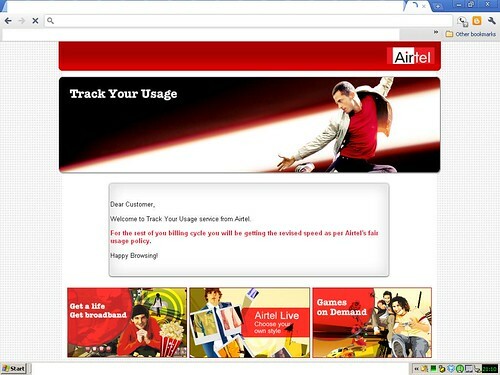 Airtel & SpeedTest.net are indicating that my download speeds are at 2Mbps. 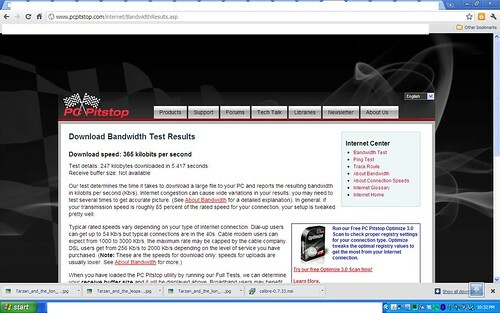 PCPitStop, DSLReports, TestMy.net are reporting that I'm at 0.2Mbps! I can speculate some reasons why some of those appear faster than other, but when I tried download software (via browser, free download manager), it still remains at around 256kbps or .25Mbps. 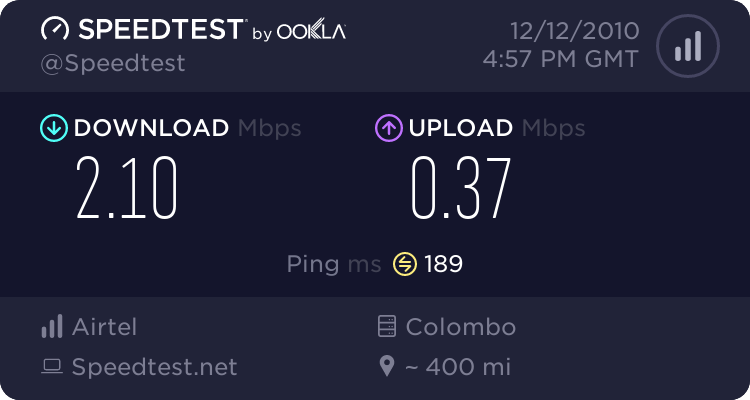 I'm on a 512kbps DSL "unlimited" download "broadband" plan which defaults to 256kbps after a certain amount of download (can't recollect the limit). Airtel is my service provider. This month is the first time, I've come across the limits being applied. And the only thing that was of significant download size for the entire month was the linux Ubuntu download (about 700MB). 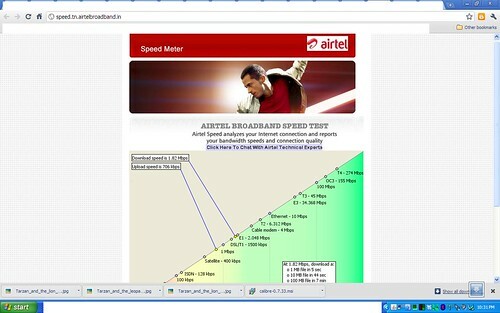 And to imagine that this comes @ ~Rs900 per month, makes me cringe at the "broadband" options that are available in India. So, why do Google Chrome 8 & 7 seem to co-exist, each of them taking about 150MB space? Further to the earlier problem about my laptop left speaker not working, the rectification required that the entire laptop bottom casing (with touchpad) be replaced. A 21-day valid quote for Rs.3,604/- was provided. After a little bit of back and back and forth between HP, their local repair assistance Mahaelectronics and me, they "agree" to "consider" my request as a special case and have now indeed replaced the necessary part without any charge under warranty. I'm now thankful to all those concerned that they did indeed have the wisdom (at least in hindsight) to take care of the request of a genuine long standing customer. I do however sincerely believe that they do need to improve their support procedure with the following (quoting from my previous post). Twice indeed has the warranty program saved my "skin". An earlier display problem which required replacing the entire display of my nx7400 at possibly Rs.15k-22k and now this. It's also neat that my warranty is an "onsite warranty" which means that they come down to my residence to take care of these issues and it saves me time and effort of taking it down to their service center. So, if you do own an HP laptop, you may want to consider obtaining the warranty, notwithstanding such instances.